When asked later as to why He chose to go through this diabolical adventure, Sathya remarked, "Even after seeing all that fortitude and the miracle of a little boy passing unscathed through all that terror, even now, you are not convinced that I am Baba; how then would you have reacted if I just made the announcement one fine day? I wanted to make known that I am Divine Stuff, impervious to human suffering, pain or joy." Meanwhile, Sri Krishnamachari, a lawyer-friend from Penukonda, heard of these occurrences in the Raju household and came to the village to study the situation and offer what help he could. He had a good look and told Venkama Raju, “It is really more serious than I thought; take Him immediately to the Narasimha Temple (Lord Narasimha – the Man-lion incarnation of Lord Vishnu) at Ghatikachalam; that is the last chance". On hearing these words, Sathya said, "Funny, is it not? I am already there at Ghatikachalam and you want to take Me to Myself!" The lawyer had no further inclination to cross-examine. On 23rd May 1940, Sathya rose from bed as usual, but after some time, He called the members of the household around Him, gave them sugar candy and flowers taken from nowhere. At this, the neighbours too rushed in. He gave them each a ball of rice cooked in milk, flowers and sugar candy concretised by a mere wave of the hand. Meanwhile, Sri Venkama Raju came and he was incensed by what he thought was a trick, hiding things somewhere and producing them by sleight of hand. He wanted the chapter to be closed before it lengthened into a tragedy. So, arming himself with a stick, he accosted Sathya and asked, "Are you a God, a ghost or a madcap? Tell me!" Prompt came the answer, the Announcement, that had been held back so long, “I am Sai Baba." At this, Venkama Raju was stunned into silence; the stick slid from his hands. He stood staring at Sathya trying to grasp the implications of that announcement - “I am Sai Baba." But, Sathya continued, “I belong to Apasthamba Sutra; I am of the Bharadwaja Gothra; I am Sai Baba; I have come to ward off all your troubles; keep your houses clean and pure." The elder brother, Seshama Raju went near Him, and asked, "What do you mean by 'Sai Baba'?" He did not reply, but only said this much - "Your Venkavadhootha prayed that I be born in your family. So, I came." The father felt that Sai Baba was a Muslim spirit speaking through the boy and so, he asked, "What are we to do with you?” Prompt came the answer; "Worship Me!" "When?" "Every Thursday! Keep your minds and houses pure." Sathya possessed by a spirit. 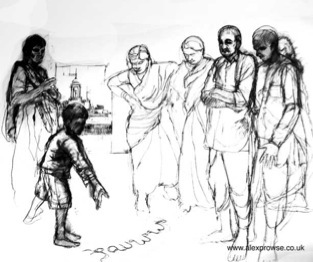 Early in Sathya Sai Baba life a family conclave decided that Sathya was possessed by a spirit, so Sathya was taken to an exorcist at Brahmanapalli. This man was a terror, with his tangled hair and grating voice. He began lashing Sathya, to beat the spirit out of the boy. His treatment also included shaving Sathya's scalp, then carving a deep cross into it, and pouring acid into the wound. He tried various other tortures, as well. So, this was one episode of Sathya Sai Baba’s life to be illustrated. I completed the task at Little Venice, London. 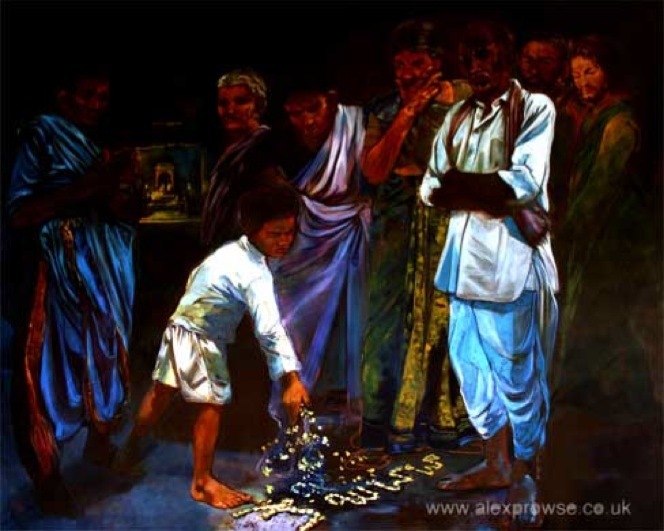 The painting was then taken to Puttaparthi, India: Sai Baba’s Ashram. I had the privilege to show the work to Sathya Sai Baba on the veranda of His temple. 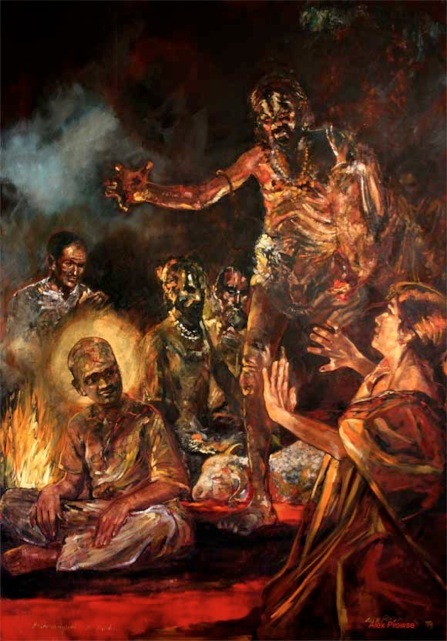 The devote sitting next to me, who witnessed Swami's blessing of the print of the painting, remarked whilst he looked at the exorcist in the painting, “Swami will take care of him tonight ". Puttaparthi weather at the time was settled, but that night Puttaparthi suffered an electrical storm that lasted all through the night. One Thursday, someone challenged Sathyanarayana and asked Him, “If you are Sai Baba show us some proof, now!" Baba replied, “Yes, I shall" and asked for some jasmine flowers. With a quick gesture, He threw them on the floor and said "Look." They saw that the flowers had formed, while falling, the Telugu letters, ‘Sai Baba’!